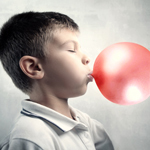 Chewing gum has a long and fascinating history. For 5,000 years humans have enjoyed chewing on bark tar, resin from the mastic tree and other plants and grasses. American Indians made a form of gum from spruce tree sap. But for most of our history, we have used chicle, a natural gum made from trees in a similar way that natural rubber is produced. Political reform in Guatemala during the 1950’s meant that big chewing gum companies like Wrigley no longer had access to chicle, so by the mid 1960’s most gum was produced from a butadiene-based synthetic rubber. Will swallowed gum harm me? Gum made from synthetic rubber may not sound too appetizing, however gum is generally harmless to your body. Have you ever heard people claim that swallowed gum will stay in your stomach for “seven years” or that it will “stick to your lungs”? While it is usually a good idea to simply spit out used gum, only a very large quantity of gum or gum that is swallowed with food or foreign objects poses any risk to blocking your intestinal tract. Your teeth, however, may be another story. Because many types of gum contain sugar as a primary ingredient, frequent gum use can be harmful to your teeth. Sugar feeds the bacteria that cause plaque, which in turn hammers away at the enamel on your teeth. A lot of sugary gum means that bacteria are getting a lot of food to grow which can lead to a lot more plaque. Additionally, while many people chew gum for fresh breath, the end result of extra bacteria (caused by the extra sugar) is even more bad breath. Studies have shown that sugar-free chewing gum is actually good for your teeth. When you chew, saliva is produced that helps to wash away food particles. In fact, saliva is your body’s first natural defense against the bacteria in your mouth. Further, some sugar free gum is made with a natural sugar substitute called xylitol that has been shown to reduce cavities and protect teeth. Even with xylitol, however, chewing gum can never replace brushing and flossing. Sugar-free gum can be a good alternative for people who love to chew gum but also want to protect their teeth. If you have an more questions, talk to your pediatric dentist today!